Looking for a shoe that will take you from this summer into the fall? Then indulge your preppy side and slip into a pair of loafers. From pink jersey to orange tapestry, loafers are the "it" shoe for designers to play with fabrication on. On my lust list are Jimmy Choo studded leather loafers but seeing that those are a bit out of my wallet's reach I'm "must listing" Sam Edelman's mirrored cap toe 'Aster' flat. Do you have a favorite? I just recently fell in love with how amazingly comfortable loafers are. Those Jimmy Choo's are amazing! I've never owned a pair of loafers but all of these are super cute! Really loving 5 & 10! I really want a pair of leopard loafers! I love that all these old trends are coming back into style! Looove the Loffler Randall, Cobra Society, and Charles Philip pairs!! Ahh loafers, ya gotta love loafers! Just saw the Sam Edelman's at Nordstrom at lunch, almost picked them up! #3 are just gorgeous! Love the comfort and chic aspect to loafers! Check out my Rocks Paper Metal giveaway! Absolutely gorgeous loafers! Love the snakeskin cap toed! Oh! I adore these shoes! They actually all are great but my shoe crush for sure Sam Edelman!!! I love this style of shoes! I have been looking for leopard print loafers for literally ages! Great choices!!! Those Jimmy Choos are great, but I might be crazy since I love those Nicholas Kirkwoods. They're just the right amount of crazy. I love loafers, especially the ones by Jimmy Choo. Can I have them all? By the way, just followed - looking forward to more! im obsessd w/ loafers, Tods are my favorite! Very nice loafers . I love the most No. 3. I loooove loafers! So comfy, perfect for everyday! 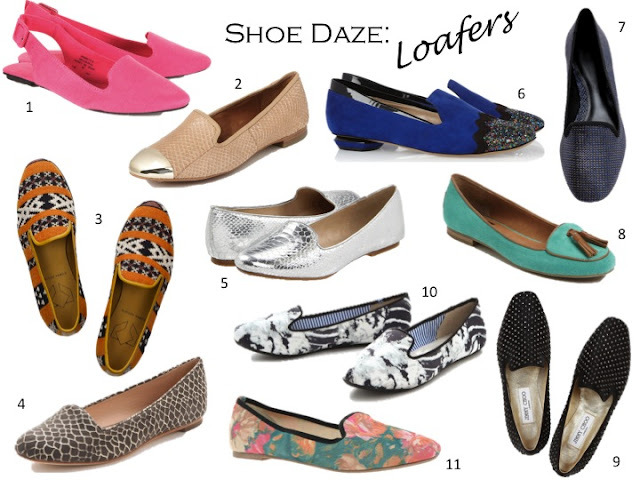 love all these amazing loafers, they're so comfy too! no. 6 is probably my favourite. love the glittery cap! Loafers are wonderful. They are so comfortable. Completly in love with this shoes... Nice post! Following you by GFC, follow back? I love this collage! especially number 2 and 6 are gorgeous! These look great! My favorites are the Sam Edelman and Charles Philip ones! thank you for visiting our blog and for following!! !we are following back!!! i like so much these shoes! love these loafers! I especially love Numbers 4 and 6! Love 8 & 9! So fun!